Aided by an ex-military officer, a young woman becomes an unwitting fugitive after discovering that her son's catatonic state may be at the heart of a global conspiracy. Plot unknown. 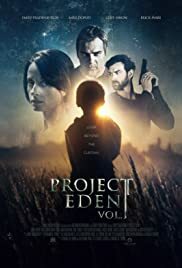 Follow-up to 'Project Eden: Vol. I'. Seeking a missing woman in North Dakota, an FBI agent and a sheriff focus on her religious zealot husband but discover something far more sinister. Australian soldier Aaron Jacobs leaves the SASR to join U.N peacekeeping forces in Africa only to find that life as a peacekeeper and a soldier are two sides to the same coin.